Kellie Hinely winning at the EMO Western States Championship in 2018. 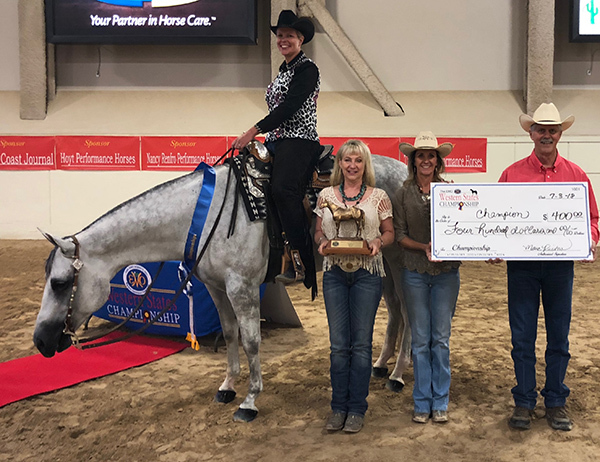 The third annual Celebration AQHA show and EMO Western States Championship Show are ramping up as they grow into one of the largest Quarter Horse events in the nation. With 10 AQHA judges and 10 sets of points for AQHA, PCQHA, and AzQHA, plus NQHA points, top competitors have found this to be the coolest way to beat the summer heat and garner lots of points. The show boasts a full slate of Quarter Horse classes for amateur, youth, and open exhibitors, combined with the EMO Western States Championship show. As always, the show will feature Cattle, Reining, Ranch Horse, English, Western, Trail, Speed events and more. The Celebration regular attracts deep competition with exhibitors traveling from all over the United States to attend. If you’re interested in learning more about the futurity classes or sponsoring a class, call Ali at (805) 226-7509. In addition, for the Walk-Trot exhibitor, the show has added Youth Walk-Trot and Non AQHA Youth Pleasure, Horsemanship, Trail, Showmanship, and Ranch Riding classes. For the Versatility Ranch Horse exhibitor, the show has added L1 Ranch Riding, Select Ranch Riding, Ranch on Rail, Non AQHA Youth, Amateur, Open classes and Ranch Trail, plus Non AQHA Open, Amateur, and Youth classes. 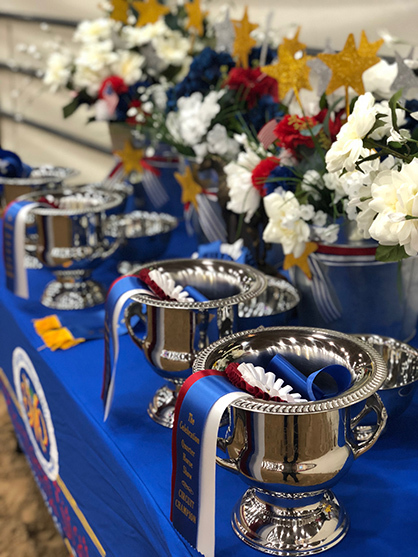 The EMO Western States Championship show rocks over $10,000 in added money, plus gold, silver, and bronze trophies to first, second, and third place, and huge championship ribbons to tenth place. The EMO Western States Championship classes are available to exhibitors who qualified in 2018 – either via state or national qualifying. For details, check the website at TheCelebrationLasVegas.com. Championship classes are held for youth, amateur, and select amateurs in a variety of classes. Thanks to title sponsor, the EMO Agency/Christine Hocutt-Senteney, for their continued support of this show. The EMO Agency gives over $10,000 in prize money, and exhibitors also receive trophies for first, second, and third place, along with huge championship ribbons to tenth place. We thank the numerous horse industry partners, owners, trainers, and breeders who sponsored the 2018 Celebration and EMO Western States Championship event, including title sponsor- the EMO Agency, Inc. CHAMPIONSHIP SPONSORS included the Pacific Coast Journal, Pacific Coast Quarter Horse Association, California Quarter Horse Association, Mission Oaks Quarter Horses, Jim and Deanna Searles, The Equine Chronicle, Sterling Custom Saddles. COPPER SPONSORS included Trendsetter Performance Horses, Kail Quarter Horses, Hoyt Performance Horses, Busick Quarter Horses, Carolyn Rice Quarter Horses, Dukes Performance Horses, Living Large, Palm Desert Quarter Horses, Joe Smith, Wheeler Performance Horses, Equine Sports Medicine, Tonya Brown Quarter Horses, Jill and Murray Show Horses, Arizona Quarter Horse Association, Nancy Renfro Performance Horses, Cheval Winery, and Pacific Coast Quarter Horse Youth Association. CLASS SPONSORS were Mike Weaver Performance Horses, Hanson Quarter Horses, Lori Pfaff, Lazy K Bar T Quarter Horses, BL Quarter Horses, Mike Dunn Performance Horses, Dr. Jacob & Elizabeth Tauber, Keegan Quarter Horses, and Vokee Quarter Horses. If you are interested in sponsoring for the 2019 show, call (805) 226-7509. For more information on the The Celebration or EMO Western States Championship, please visit TheCelebrationLasVegas.com or on Facebook at The Celebration & EMO Western States Championship. For hotel reservations, use the special code for lowest hotel room rates: CEL0624.